This is a short blog for Day 7. It was a roller coaster day for the open team starting with a small 13-17 loss to a tough Finnish squad who outplayed most of the field equalling the relatively strong play of the Canadian lineup (Lebi/Jacob and Fergani/L'Ecuyer). This round dropped us back into sixth place. Round 2 had looked like the key match of the day with us taking on Denmark another team fighting for a playoff spot. Lebi/Jacob and Demuy/Fourcaudot headed into the fray. A strong match led to a 20-10 victory putting us back into the 4th and final qualifying spot, 4VPs ahead of the French with one match to go. Firmly in control of our own destiny heading into the final match against Trinidad and Tobago the 5:10 curse bit again. The 5:10 match has not been kind to our Open Team this year with only 12/75 VPs in the previous 3 evening matches. A 7-23 loss in this match caused our roller coast to crash into 9th place and out of the playoffs in the final round. Surprisingly the Romanian squad in 7th before the final round and only 18VPs to come from their BYE, captured the last playoff spot as teams from the bottom of the table including Pakistan, China Macau, and Trinidad and Tobago acted as giant killers taking out Ireland, France and Canada respectively. Although a disappointing finish to a solid week the team was only 5 points out of qualifying. The pairs played very well overall and were supportive of the other pairs throughout. Thanks for reading and look for a longer update sometime over the weekend. Day 5 dawned with the Open Team looking up at a playoff spot for the first time in the event and 2 matches against the bottom half of our group (Japan, Pakistan) to go before the Yom Kippur break on Wed night and Thursday. Crunch time had arrived and Lebi/Jacob and Fergani/L'Ecuyer were back in the fray against Pakistan to try and shake off their loss against France the evening before. Pakistan proved to be somewhat erratic and aggressive in their bidding techniques but the team prevailed in another basketball match - winning 60-36 for a 21-9 VP win. Fergani/L'Ecuyer were joined for the second match against Japan by Demuy/Fourcaudot and the team put together a very strong match scoring 63 imps while only giving up 3 imps to secure a 25-2 victory and 46 out of 50 victory points for the day. Given that the structure of the round robin is effectively one long match with common boards (although different opponents) one useful indicator of the overall quality of play of a given team is total IMPs. Canada's results VP wise have been very good but we have been winning by scoring lots of IMPs while giving less (but still lots away). Looking at total IMPs lost can be another good indicator to how well a team is performing. For France (-353 while scoring 527) this is a better feel for why they have moved up the table. Italy having given up only 251 while scoring 741 is even more impressive. Canada's record has higher volality and can be a risky way to win if the plus IMPs stop coming while the minuses continue (never mind the added stress on the captain as the results roll in). During the drive to the finish it can be tough to make ground... Ireland and South Africa both had reasonable days but find themselves significantly further behind then where they started the day. Although mentioned elsewhere the German women are on a stunning pace winning 7 straight blitzes and averaging over 22 VPs per match. 2 of the other Open Groups are down to a battle among 5 teams for 4 positions. Note that the qualification score in those groups will be much higher then in Group A.
Preempting with a long minor and side 5 card majors has had mixed results... Two 5-7 hands with spades yesterday favored an initial pass to allow finding the 4S game or sacrifice over 4 H, while the 5-7 hand with hearts and clubs the other day favoured being in 5C quickly to bury the opponents spade grand slam... Some of you might say you would never preempt with such hands but significant portions of the open field did showing the importance presently placed on the application of pressure. Initial Butler scores came out on-site today... These scores are much abused and the consensus appears to be that other than as a Captain's tool for assessing in match performance (once odd hands are tossed out) they are somewhat negative. They effectively provide IMP pairs scoring which does not adjust for random good or bad results, quality of opponents particular pairs have played or specific bad matches driven by extraneous factors. The scores tend to appeal to the more ego driven pairs but are not conducive to the team dynamics required for success. These scores should be used at your own risk in drawing any conclusions about what has happenned. This board is more for interest. E deals with none vulnerable. A typical auction was 1H-2C-3H-5C followed by X, more hearts or more clubs. The interest is in the play. On anything but a heart lead 5Cx is cold by the South hand and always cold by North. An advertisement for always leading your partners suit. Meanwhile 5H is cold on any lead and is presented as a play problem. Looking forward to qualification on Friday (today) and look for the last day preview posted earlier. Apologize for the delayed posting of the Day 4/5 as have had some other items to attend to. The Day 5 post will follow while Day 6 was an off Day. As we enter Day 7, Group A remains competitive with Italy pretty much a lock for first place and 8 other teams fighting for the final 3 playoff positions. Romania, South Africa and Ireland have their work cut out for them as they are currently 10 VPs out with many teams in the mix. Romania and Ireland are also both due for their BYE round today which reduces their daily maximum in VPs by 7 to 68 further adding to their challenge. Estonia presently in second is coming off of a punishing loss to Brazil and has yet to face Denmark and South Africa from the top of the table. Denmark needs to face Canada and Estonia from the top of the table. France faces Italy and Ireland from the top of the table. Meanwhile Brazil (South Africa), Canada (Denmark) face only one other team that is in contention improving their chances and given their current positioning (4/5 by 1 VP, 6th by 4.5VP for Brazil) are my favourites to capture the final playoff positions. All teams in the event are dangerous so the simpler schedule should not be taken lightly. Expect that France will come through from Estonia, Denmark and France although these predictions are biased on my desire to see Canada go through and what that implies for our match with Denmark and their ability to go through. If Denmark and Estonia return to their previous form they will make life challenging for those chasing them and could easily go through... Also any one of the other chasers (Ireland, South Africa, Romania) could have a big day and move into a playoff spot, while a large loss for any of the other top teams will turn them into chasers with time running out. Round 17 - Canada v Trinidad and Tobago, South Africa v Estonia, all? That is however getting ahead of ourselves. Canada controls its own destiny today... One match at a time today with Canada to face Finland, Denmark and Trinidad and Tobago. Lebi/Jacob and Fergani/L'Ecuyer will start. Live scores should now be available from the WBF site and can be watched with the BBO vugraph to see all of the action at all of the tables. Day 4 dawned with a light schedule. A first match against Slovakia followed by a bye, followed by an important match against France. Lebi/Jacob and Demuy/Fourcaudot started the day against Slovakia. A small win helped to recover from the loss to South Africa but securing only 17 victory points was not sufficient against a bottom of the table team as we began to drift back towards the pack of 8 teams (South Africa, Brazil, France, Ireland, Estonia, Denmark, Romania and Canada) chasing playoff spots 2-4. Our fate to be fighting until the end was confirmed in the next match when the 18 points for our BYE round were insufficient to keep us in a playoff spot as the top teams pushed towards qualification. The day finishes with Canada in 7th position. The poor results at the end of each day have not improved the dinner conversations and have made everyone anxious to move onto the next day's play. Loooking forward to Day 5 and getting back into qualifying position. Bidding grand slams needs to be carefully weighed... Once again in the Canada vs. France match a grand was bid by Canada with only game being played in the other room. A small slam would have created plus 13 rather then the loss of 12 imps that occurred. Bidding and showing your two suiters and quickly to allow partner to judge the hand correctly continues to be very important. 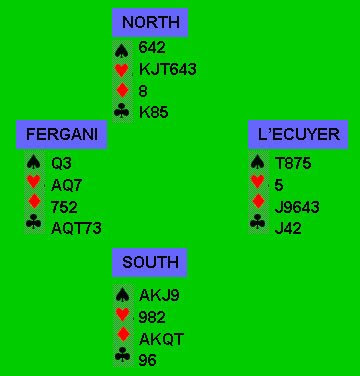 Most of the doubled making contracts being the result of the hidden double suit fits..
See below for a hand from the Canada/France match in Round 12 with N the dealer and E/W vulnerable. Many North's opened 4H and the spotlight shifted to West with options for bidding Double or 4S. Both West's bid 4S and played there going down. 6D is cold on the EW cards and it is worth considering whether you would get there even with a double as there were a number of E hands who passed the double for a rather unsatisfactory Down 1 that still won imps against the 4S bidders. The schedule for Canada on Day 3 included more teams in the top of the group: Estonia and South Africa sandwiching bottom of the table Kenya. Continuing with the lineups from the previous day Fergani/L’Ecuyer and Lebi/Jacob kicked it off against Estonia, followed by Lebi/Jacob and Demuy/Fourcaudot against Kenya. Both lineups played strongly with a 21-9 win over Estonia and a 25-4 win against Kenya. A strong start to the third day as the team reached the halfway point in second place in Bracket A. The third match against South Africa was not as successful. With the Italians and Brazilians also on Vugragph it was time to watch the results come in and plan the lineups for the rest of the event. With the Italians ruthlessly taking out the Brazilians (92-0 before Brazil got on the board) attention shifted to tracking the Canada Open Team scores… Unfortunately South Africa seemed to have the same plan for our Open Team and we suffered our worst result of the tournament with a 25-3 loss and a drop to fourth place. Overall the team is playing very well (except for the 5:00 match) and driving towards a qualification spot. The schedule lightens from here with 2 matches and a bye on Tues, 2 matches on Wed, a day off on Thurs and three more matches on Fri. Five of the remaining matches are against the bottom third of our group with 2 matches remaining against contending teams. Now for the hand of the day and a superb lead by Fergani to create an important swing against Estonia in Round 7. Kamel found the inspired lead of the H7 figuring the HK in the dummy. Declarer fell into his trap and flew K setting up 2 heart tricks and when declarer later hooked into the double SQ the defense had 4 tricks and 10 imps. Day 2 is now in the books with mostly positive but mixed results for the Open Team. The Open Team was to face China Macau, Romania, and Brazil. The team continued their winning ways with a 43-6 win for 24 VPs over China Macau with Lebi/Jacobs and Fergani/L'Ecuyer in the mix. Match 2 was against the Romanians who sat in a qualifying spot. After a hard fought match Lebi/Jacob and Demuy/Fourcaudot ended with a losing tie 30-31 and 15VPs. Unfortunately at one table the pairs were overtime by 3.5 minutes and with no director having been called both teams were penalized 0.5 VPs each for the delay, taking the result for this match to 14.5 VPs. Lesson 1 from the Conditons of Contest for the Day. Match 3 was against the Brazilians expected to contend for one of the 4 qualifying spots but at this point in the middle of the pack. The Brazilian team contains a number of previous World Champions with long experience in these events. Jet lag, fatigue and other factors seemed to kick in for this set with Demuy/Fourcaudot and Fergani/L'Ecuyer going down to a sizable 47-6 defeat and only 6VPs. At the end of Day 2 the Open Team remains in a qualifying spot with 106.5 VPs tied for fourth with Romania. Canada Open gained an additional VP from the match against the Irish on Day 1 with the score being corrected to 55-30 (21-9 VPs) based on a wrongly agreed score on the table that was identified (thanks Nick) and flagged to the Director's prior to the end of the score correction period. When flagged to the Irish the next morning the 1990 Canada-Germany ruling was identified as potentially disallowing the correction. In this case the correction was allowed due to its identification within the score correction window (30 minutes post the end of play). Lesson 2 from the Conditions of Contest. All teams can be dangerous and there are no easy matches... In Group A the top of the table Italians were beaten by the bottom of the table Albanians in the second match of the Day. West was the Dealer with E/W vulnerable. - What do you bid with the East hand? do you play transfers? is 2C forcing or non-forcing? can you afford to pass with only 1 spade and limited values but good distribution? - E continued with pass. S bid only 4S and the auction ended there. Should either E or W take another call? Note that the results at the Canadian Open and Women's 4 tables on this board included the following results EW: 6C*-1 for -200, 4S+1 for -450, 5H*-1(post committee) for -200, 5S*= for +650 so there was lots of action on this board - the final board of Day 2. It was an important day for the Open Team. With only 4 of 17 teams qualifying for the Knockout round it was important to get off to a good start. Day 1 saw Canada facing Albania, Italy (one of the favourites for championship, and Ireleand (a strong contender for a qualifying spot). Everyone showed up early for the first match. Jacob/Lebi and Demuy/Fourcaudot were in. The team kicked off with a 69-18 win over Albania to secure the maximum 25 Victory Points from the first match. L'Ecuyer and Fergani were +140 in the Closed Room in 2H when Fantoni and Nunes reached 4H in the Open Room so 11 imps (+5/-6) hung in the balance. With the favourable diamond and heart positions, the computer who can see all the hands knows that 5H can be made but it is not so easy at the table. Lebi lead the C4 to the K and A and Jacob returned the SQ. Fantoni won the SK in hand and ruffed a club to lead a diamond. Jacob quickly played the DK ! presenting Fantoni with a problem. Fantoni cashed the HA seeing the 9 fall and ruffed another club in dummy with the HJ. Reluctant to see the DQ ruffed, the SA was now followed by another S. Fantoni eventually tried cashing the HK hoping for the opponent hearts to be 3-2 and had to go down 1, 5 imps to Canada instead of 6 away on the way to a 25-22 victory. Round 3 saw Demuy/Fourcaudot with L'Ecuyer/Fergani against a dangerous Irish squad. Another good match saw a 53-30 victory (pending a positive score correction to 54-30) and 20 (21) more victory points to Canada. Bridgemates are in use at the Championship to capture all contracts, scores and leads in real time. It is taking some time for all players to get used to this. A note to all who may be watching the results stream in on Swan Games or BBO that we have yet to see an Open Team match with no score corrections. Please check back shortly after the match if you want to reconfirm the accuracy of the scores. We are hoping for error free scoring to start on Day 2. Day 2 sees the Open Team facing China Macau, Romania and the always-comptetitive Brazilian team.